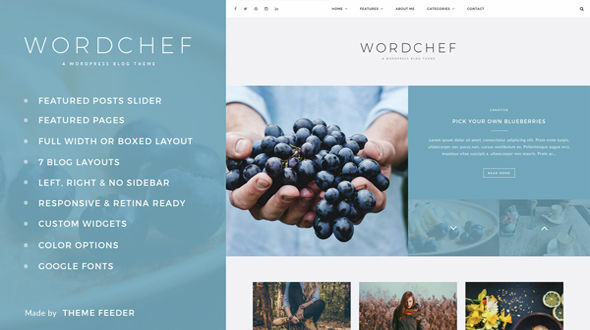 WordChef is a clean and simple WordPress Blog Theme. Bring your words to life With multiple post formats, a featured posts slider, featured pages, full-width or boxed layout, many color options and a choice of 7 blog layouts. WordChef is easy to customize and its attractive design and smooth functionality is sure to give you and your visitors a great experience. Version 1.3 – Added custom hover color option for top bar social and search icons. Fixed WordChef Image banner widget bug that sometimes prevents image from showing.